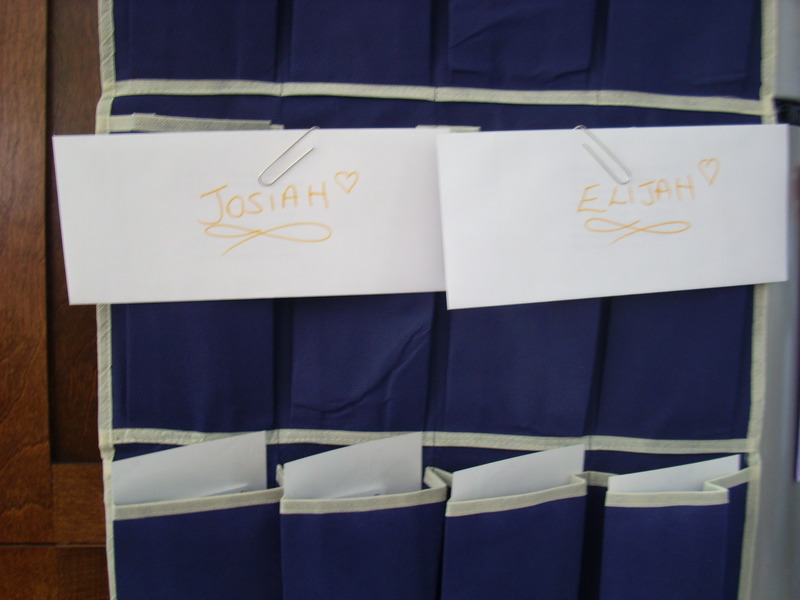 Josh and I were away recently on a church missions trip. I will share more about that soon! This was my first missions trip and I found it SO HARD to leave the boys for a week, even though they were in very capable hands. I needed to make sure there was a consistent connection with them every day while we were away, just in case phone lines went down. I love to write notes to loved ones and tell them what I love about them. This idea grew to leave notes for the boys for each day we were away, highlighting one thing I loved about them, or one thing that was awesome about them. I included a picture to go along with the note. I taped a note to the back of each picture. The notes and photos were slipped into pockets of a shoe organizer from the dollar store. Eight notes for each boy. I hope this keeps a strong connection going while we’re away and encourages them in our absence.